“Finding a personal and cultural click between people is essential when it comes to placing finance experts temporarily into an organisation,” says Grant Robson, Executive Chairman of The Finance Team. On Monday CFO South Africa met with Robson and CEO Richard Angus to chat about their new model, providing experienced finance experts to businesses that need temporary or permanent help. “Trust, respect, honesty and integrity are our four pillars,” says Angus, who started the company a year ago. The Finance Team provides experts to small and medium-sized firms for a few days a week and also places accountants and finance cracks into bigger companies for short term projects or to bridge a gap between appointments. “We build relations of trust with clients so we become the people they phone when they are in need,” says Angus. 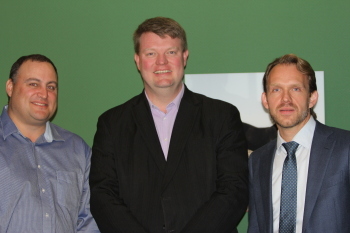 Angus (middle in the picture) and Robson (left) met with Melle Eijckelhoff, director of CFO South Africa to discuss the exiting opportunities both organisations have on offer for CFOs and top finance professionals. The full account of the interview will appear on this website at a later stage. Sub Saharan Africa – The Next Frontier?